A disclaimer: I've long been a fan of Jo�lle L�andre, and as a buyer for Squidco, always pick up any album that I see her leading or playing on. I admire her impressive skills on the double bass, both plucking and bowing, showing characteristics from the history of free jazz bass players and her own, very unique path on the instrument. And for myself, even more endearing are her vocals, very much in the vein of Phil Minton or Joane H�tu; her vocalizations are confident and strange, the two highest compliments I can give to a free improvising vocalist. She has an outstanding discography of more than 100 albums as a leader and/or in the company of some of free improvisation's finest global players. Her creative interests seems restlessly infinite, and the diversity of her projects is exemplary. But more specifically to my disclaimer: L�andre has also been a very encouraging angel for Squidco, writing to us in the most charming manner since our earliest days, thanking us for taking on the music that we sell and bringing a sense of satisfaction to me that we are part of the globally connected set of musicians that are driven to create the music we so admire. I was excited when I saw that she had an 8-CD box set on the Polish Not Two label, a retrospective of sorts bringing a variety of settings and groups together into one magnificent package. Not Two does not disappoint, providing a sturdy box with an outer sliding sleeve jacket, inside a 16 page 10" x 5" booklet that rests over two compartments containing 4 CDs each. The booklet starts with an essay from Stuart Broomer, and a longer retrospective article on L�andre from Marciej Karlowski, plus photos, quotes and credits. Each of the CDs presents a different grouping of L�andre with other like-minded improvisers, with the exception of disc 6 which is pure L�andre solo. The groupings are: CD 1, Les Diaboliques (L�andre, Irene Schweizer, Maggie Nicols); CD 2, L�andre & Mat Maneri; CD 3, L�andre & Lauren Newton; CD 4, L�andre & Jean-Luc Cappozzo; CD 5, L�andre & Fred Frith; CD 6, L�andre solo; CD 7, L�andre in a quartet with Zlatko Kaučič, Evan Parker and Augusti Fernandez; CD 8 duos between L�andre and Zlatko Kaučič, Evan Parker and Augusti Fernandez. Most of the material was recorded in 2015 & 2016, with the Solo disc from 2005 and the Maneri duo from 2011. The first disc of the box opens strongly with Les Diaboliques, the trio of Jo�lle L�andre on bass, Irene Schweizer on piano, and Maggie Nicols on voice. "Diaboliques" or "little devils" is an apt name for this grouping, bring both superlative playing skills and a sense of mischievousness to their improvising. The trio is caught live in DOM in Moscow in 2015. All three are masterful players, technically superb and with long histories in a variety of settings and approaches to improvised music. They are also all interested in unique approaches to improvisation, and their performances have both sophisticated and polished playing extremely balanced by unusual vocalization, inside piano playing, and eccentric bass technique. The result is exhilarating and unpredictable. The concert begins with the full trio for an extended dialog with tight interactions that take strange twists and turns, Nichols and L�andre both bringing bending notes and odd utterances over Schweizer's anchor; halfway through, the converstation takes a strange turn, breaking down to both Nichols and L�andre singing and speaking, Schweizer inevitably returning in a strong direction that takes all three players to the top of their game, Nichols closing on a sighing note. Nichols and L�andre follow with a dynamic duo, Nichols getting wilder as her voice warms, trading operatic exercises with raspy cries and odd wordless phrasing, while L�andre trades similar statements in furious bowing, powerful plucking and unusual harmonics. The performance continues in wonderfully consistent work through to the 5th piece, where L�andre and Nichols step back for a solo from Schweizer that showcases her powerful technique and nimble mind as she constructs lyrically inclined and extended statements that blend compositional and jazz phrasing in effortless ways. The concert ends with the full group uniting in a tour de force finale. 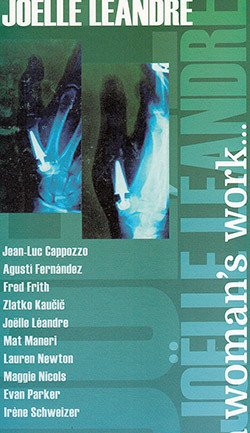 The next four CDs in the set are all recorded in superb clarity by French engineer Jean-Marc Foussat, who is also a free improvising keyboardist, electronics whiz, and vocalist, bringing a unique perspective to his engineering work. Fou als runs his own label imprint, Fou Records, which releases both his own new material and also essential recordings from the 80s with artists including Derek Bailey, Evan Parker, Jo�lle L�andre, Willem Breuker Kollektief, &c.
This duo set brings the French bassist together with New York violinist Mat Maneri for 6 improvisations in a chamber jazz vein. The confluence of strings is unique to the box, different than the CD with Fred Frith in the seemingly traditional approaches both bring to the set. Recorded at La Java in Paris, both bring a mix of contrasting and complementary styles to their playing. The music is perhaps more sober than other albums in the set, but no less exciting in the sophisticated approaches both employ. I particularly enjoy the contrast between L�andre's plucking and Maneri's bow work, providing staccato counterpoint to Maneri's journeying forays. What's not heard in this set is L�andre's voice, lending a distinct air of profundity to their improvisation, which is somewhat unique to the other more eccentric performances heard in the box. The 3rd disc continues the series of duo recordings that dominate the set. The pairing of L�andre on double bass and free improvising vocalist Lauren Newton, captured in superb clarity, are from the Lecture Room at FRAC of Besnan�on. There is nothing conventional about this format, though on the surface it is straight-forward that L�andre is the agile foundation for Newton's exquisite voice and flights, sallies, and expeditions in free directions. While mostly wordless free vocalization and double bass, The last improvisation has Newton telling the story of an old lady with a pig going to market, as L�andre accompanies with interaction that supports, responds and interrupts Newton's story. It's dramatic, quirky, and a curiosity, as Newton interjects her incredible vocal technique into the story. As the tale builds in complexity, L�andre's accompaniment builds in intensity, pausing and starting with increased vigor as the old lady's journey continues. It's one of the most amusing moments of the box set without pandering or breaking the continuity of their performance � it makes sense that Newton's wordless vocals would fit so well with actual words, and gives the feeling of pulling back the curtain on what goes on in her mind while she vocalizes. An ominous and heavy conversation between two French players, the set starts with L�andre bowing over Cappozzo's darkly lyrical and excursive playing, a nearly 10 minute masterpiece of clarity in conversation. Cappozzo is three years L�andre's younger, so the two share both country and generation. Their compatibility is clear, and their similar experiences brings patience and wisdom to their playing. For the second piece L�andre adds her voice, ruminating over distant twilight trumpet. The set continues through a mix of bowing, plucking, lyrical, serpentine, and pointillistic playing, a wonderful blend of style and approaches as the two jump from topic to topic and find common ground in every conversation. L�andre uses her voice sparingly as an accent to the playing, Cappozzo sometimes responding to her uniquely idiosyncratic ways. In many ways this disc is one of the most consonant of the set, as the two seem ideally suited to each other's playing and perspective. As a long-time follower of guitarist Fred Frith's albums, from the earliest of Henry Cow days through his Ralph Records solo albums to his now decades-long career as a free improviser, I was eager to work my way to this disc. I was not disappointed: Frith and L�andre are captured live at Instants Cahvir�s in 2016, again by Jean-Marc Foussat, for a beautifully recorded set of 3 dialogs, two of them about 17-minutes in length, with one final shorter piece to finish. Frith's remarkable creativity and formidable extended techniques on the electric guitar fit perfectly with L�andre's approach, no doubt fueled by years of one-off projects like their 2003 Tempted to Smile release on Spool, or their 2012 MMM Quartet album Live At The Metz' Arsenal on Leo Records. Frith takes a frequently percussive approach to his playing, albeit often in tangential ways, extending his guitar with objects and extracting unusual moans and sighs from the strings. L�andre starts the set with an abstracted approach to an anchored bass line, slowly evolving away from it through forays in both plucking and bowing, along with her typically eccentric techniques that play well with Frith's musings. Settled in, the second dialog begins in a more abstracted way, Frith bringing in sounds like a diving airplane over L�andre's frantic bowing. The discourse continues with great technique and subject, building in intensity as the piece continues, L�andre eventually entering the extreme high registers of the bass as Frith plays a rapid string figure, inspiring L�andre to the only clear vocal additions of the set, as they finish the piece to enthusiastic applause. The final piece ties up the set in a brief encore of about 5 minutes, pulling all of the elements of the concert into play as L�andre bows deeply and Frith cuts loose in assertive playing, both using voice for rhythm and murmuring counterpoint. The set fadies out over L�andre's beautiful cooing. The excitement of the crowd as they applaud this magnificent set is enough to make the listener jealous, but thankful that Foussat did such a wonderful job capturing the night. The 6th CD in the box is pure L�andre, captured live at a concert titled La voix est Libre [The Voice is Free] recorded by Radio France at Bouffes du Nord in Paris. The audience is large and appreciative, attentive to her playing and responding along with her. The concert starts almost conventionally, but quickly L�andre starts bowing with strong harmonics, alternating between bowing and plucking, pushing herself with short vocal prompts as the pace builds. The great applause after her first piece seems to electrify her, as she starts her second improvisation with upper register bowing that's almost psychedelically electronic sounding. This continues for almost 5 minutes, throwing deep percussive motions and bottom end bowing to return to rapid higher register work, lightly hitting the instrument for a slight percussive accompaniment. Her breathing builds, and suddenly she unleashes an operatic tirade, a powerful voice that descends to the devil, growling, grunting, possessed and virtually speaking in tongues. And then she relents, and starts speaking in an almost imploring tone; I don't speak French so I don't understand what she says that brings laughter from the audience, but it's a wonderful release from the previous intensity, as she finishes the piece with a farcically lyrical turn, bringing cheers, laughter and more hearty applause. The concert continues, the elements are similar but L�andre experiments and changes her approach so that each break brings something new and unique, bending, rising and lowering notes, her powerful technique making the double bass ring as only a masterful player can. Her confidence and playfulness are at times dark or menacing, but always there's a mischievousness and joy behind it. At times she speaks to herself in a personal language that drives her into unusual forays and frenzies, with a sense that's she's somehow possessed by an impish spirit. She so thoroughly puts herself into her performance I can't imagine how exhausted one would be after a concert like this, yet I have the feeling she could play the entire night, continuing to find inventive, impressive, and awe inspiringly new music to perform. An absolutely magnificent concert.